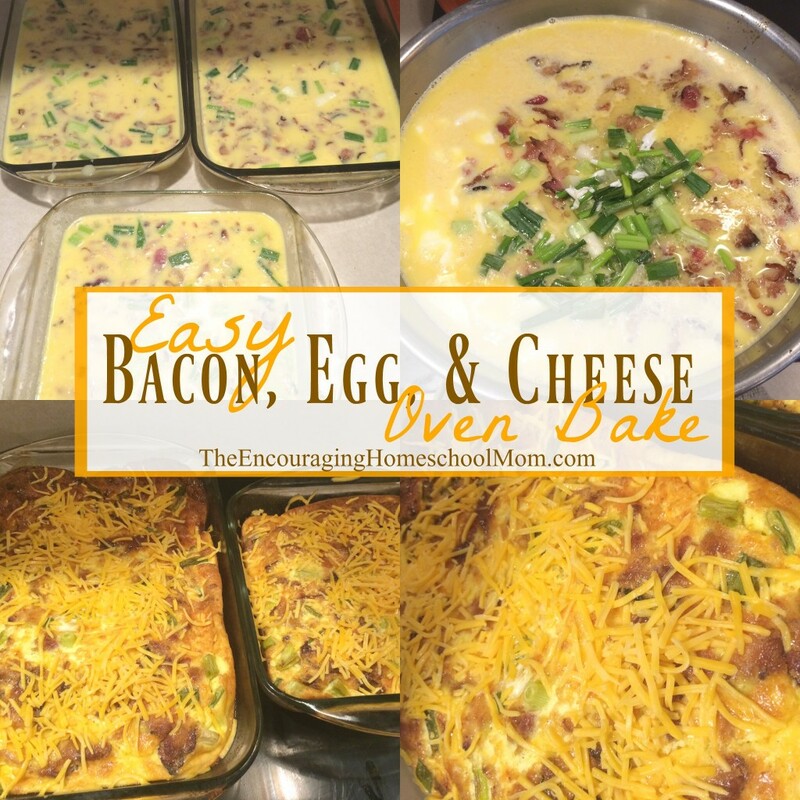 Easy Bacon, Egg, and Cheese Oven Bake Recipe | Large Family Style! In today’s new video I share my easy bacon, egg, & cheese oven bake! This simple one dish meal is so good and doable with just a little time in the kitchen. If you’re doing Trim Healthy Mama this would be an S meal. It’s low carb if you’re doing Atkins, etc. And it’s just plain yummy no matter your family’s eating style. Of course I make a boat load of anything I cook. This recipe came in around $10-$12, but it made several casserole dishes full. As always, make it work for you! 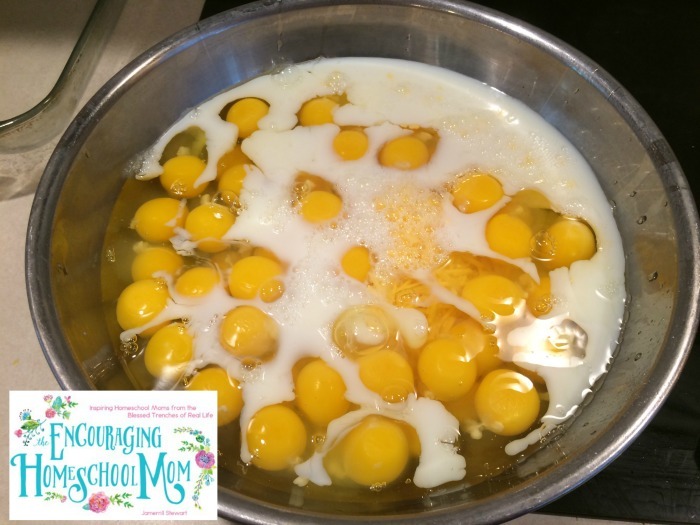 Eggs – I used 4 dozen eggs. This made enough for dinner with leftovers to sprinkle throughout the following day. Some kids had it as a leftover for breakfast the following day. My husband had it the following day as a lunch. Cheese – On this day I used 4 cups of mild cheddar. I’ve used provolone, and even a mix of provolone and pepper jack before. Bacon – 2 lbs of bacon. You can read here on how to cook bacon in the oven – hello, life saver! Sour Cream – I like to add in 1 cup of sour cream. I was out on this day so I used 1 cup of plain greek yogurt. Greek yogurt can be used as a substitute for sour cream if you’re out. 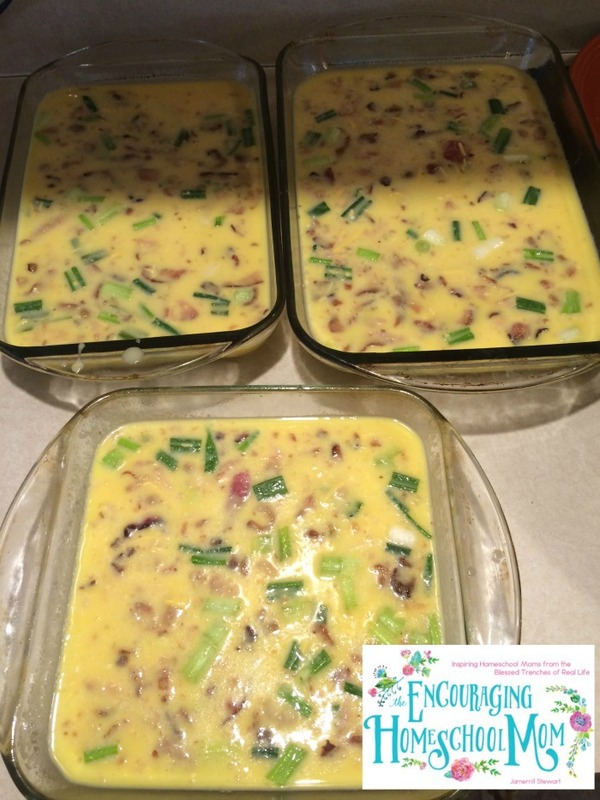 Additional items – On this day I also added in some green onion because I had it on hand. You could add in peppers, mushrooms, ham slices, and more! Make it work for your crew. In a large mixing bowl I added the 48 eggs, 3 cups on milk, 1 cup sour cream (aka greek yogurt), 2 cups cheese, 2 lbs cooked bacon, green onions, salt/pepper, and mixed on medium speed with my hand mixer. Next I poured the mixed ingredients into three glass baking dishes (here are the baking dishes I use on Amazon with my referral link). Then I pop all three baking dishes into the oven on 325 for 40-minutes. 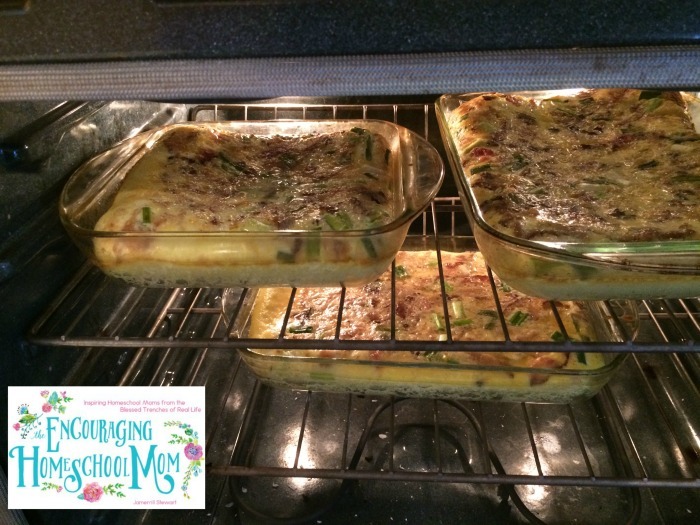 I then pull the three baking dishes out of the oven after 40-minutes. Then I sprinkle the remaining 2 cups of cheese over the tops of each bacon, egg, and cheese bake. 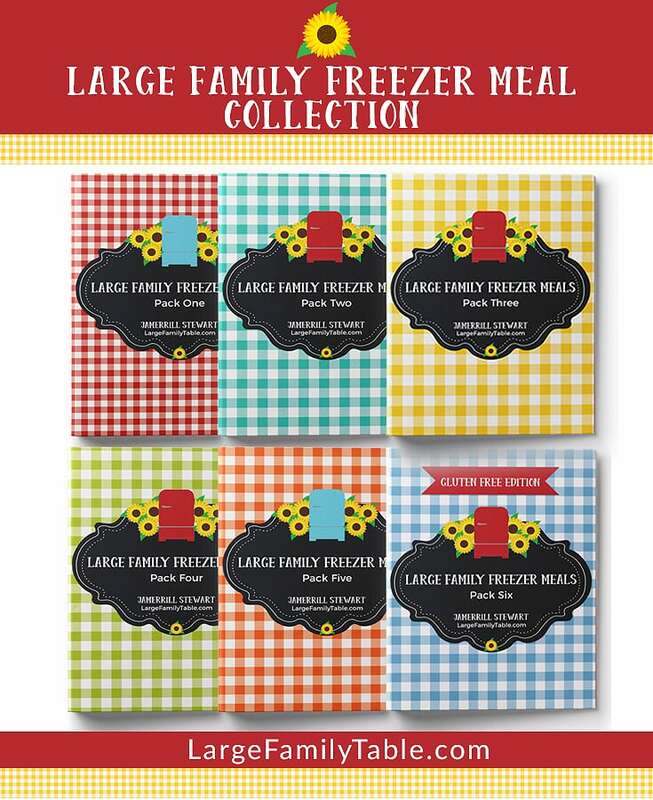 We just slice and serve at dinner time! Serve with extra bacon (like there’s any extra bacon just sitting around, lol), toast, bagels, or fruit. 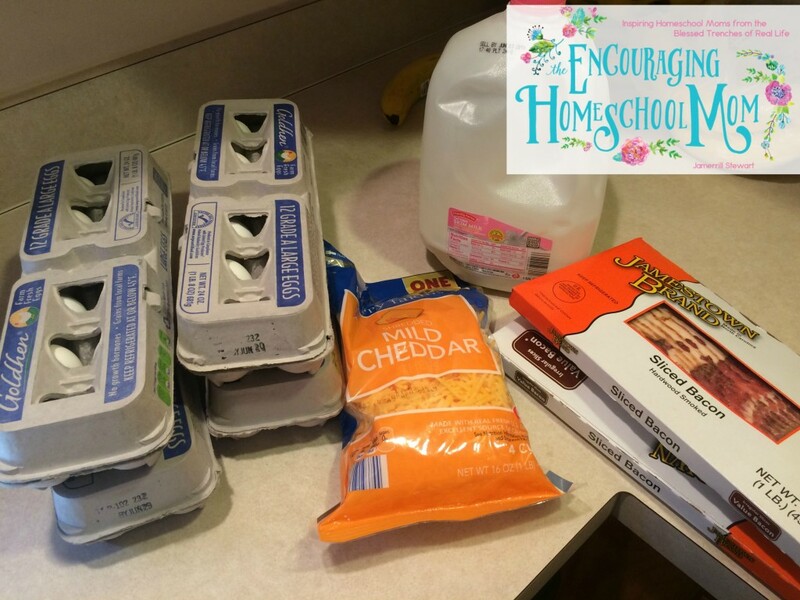 Click here to watch the full Easy Bacon, Egg, and Cheese Oven Bake Recipe | Large Family Style Cooking Vlog. Just added this to our menu for this coming week! I love when you share recipes your family enjoys. I scale everything way down for our little family of 3, but I still love them! Thank you so much for sharing and being such a kind inspiration to me as a Mom. I always enjoy reading your posts, they inspire me in so many ways. Hey girl, I just had to chime in that I just found your blog and youtube channel yesterday and I am BINGEING lol. Great GREAT material and vids, I love that you are just a mom keepin’ it REAL! 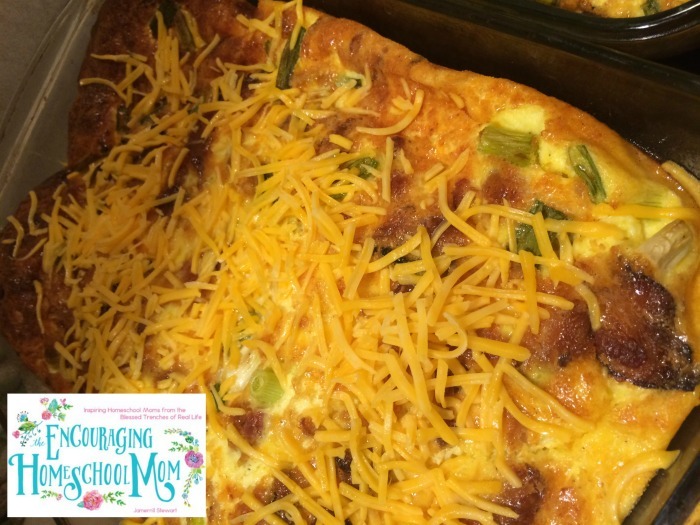 🙂 I’ve got five kiddos, and I’m always on the look out for yummy, large family recipes, and this one certainly fits the bill! And bonus, I’m a THM as well! (20 pounds gone…prolly 50 more to go…) Just want to say, you’re doing a great job showing Jesus to all of us mommies, and to your family. Keep up the great encouragement, and I’ll stop by often! !